Wheelhouse bike Co. is owned and operated by the Bergquist family: Dan, Sarah, and Jakob. Dan was born and raised in Chatham and has spent most of his life in the fishing industry, shellfishing and lobstering. He spent his college years working on ski mountains in Colorado and Vermont, and in outdoor sporting goods shops building and selling bikes. Dan is obsessed with bicycles, and he has passed this obsession down to our son Jakob who loves riding on BMX pump tracks and participates in the kids PMC ride. Sarah is a metalsmith and enjoys welding recycled bike parts into sculpture. She also loves riding her electric bike to the beach. A long time member of NEMBA, Dan spends most of his free time riding on mountain bike trails all over New England. He has been a public advocate for the responsible use of fat bikes on the Cape Cod National Seashore, and loves riding Fatbikes in the snow at Winterbike in Vermont. Dan was a lobsterman for 15 years on the f/v SAGA out of the Chatham Fish pier. 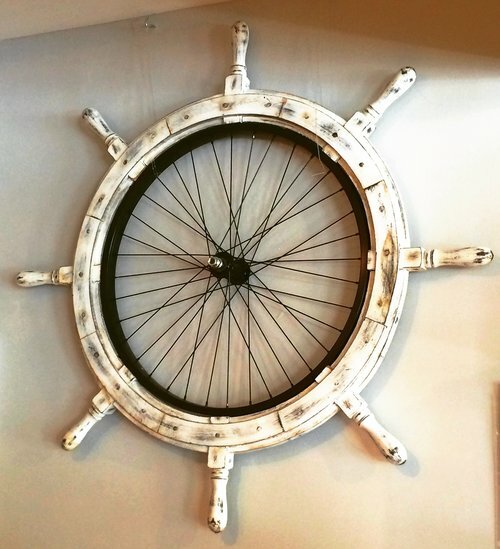 All that time spent in the wheelhouse of a fishing vessel gives special meaning to the name of the shop and our logo combining a ship's wheel and bicycle wheel. Getting his certification at Barnett Bicycle Institute in Colorado gave him the confidence to follow through on his long time dream of opening Wheelhouse Bike Company, and in 2016 we renovated the old pharmacy on Crowell Rd in Chatham Village by the bike path and made it a reality! We are so excited to share our local knowledge and love of family and bicycles with you!